Throughout November the Rheidol valley is to be illuminated by the autumnal sunshine and fiery leaves that line the valley. During this time the Vale of Rheidol will be running special Sunday Lunch and Autumn Colours train journeys up the valley every Sunday, giving everyone the chance to see the beauty of the valley throughout autumn. Departing at 11.30 from Aberystwyth and Arriving at Devil’s Bridge for 12.30. The train waits for about 2 hours at Devil’s Bridge, providing enough time for visitors to munch a delicious Sunday Lunch delight at the Hafod Hotel. There’s even enough time to go for a refreshing after lunch walk around the famous Devil’s Bridge falls! Typically, many of the Great little trains of Wales wind down at the end of the summer; however, the Vale of Rheidol is bucking the trend. The Railway wants to showcase the beauty of the valley during autumn and what better way is there to see it than getting a unique perspective of the valley from the comfort of a heated carriage. On the 9th November, There was a Remembrance Day special. During the war, the railway played a major role in carrying the troops to Territorial Army training camps in the Rheidol valley. As part of the Remembrance Day passengers took the same journey as the troops did, in remembrance of those that fought during the war and may have also traveled on the line! Along the journey, the engine carried a wreath up to Devil’s Bridge, where it was then placed on the war memorial near to the Devil’s Bridge Station. So come visit the Vale of Rheidol this November and see the valley change colour into a dazzling autumnal blaze. oldmrheath, RayMason, lil Bear and 1 other person like this. MuzTrem and michaelh like this. Personally, I think that "lack of variety" is, in some ways, part of the Rheidol's charm. The locomotives and rolling stock have, basically, remained unchanged since the 1930s, with no second-hand stock or new builds added. So you know that you'll always get a truly authentic experience, every time you go. That said though, the occasional visiting engine is always fun - I enjoyed Palmerston's recent visit, and it would be great to see more! michaelh and ValeOfRheidol like this. In December 2013, a tremendous task was put upon Adam Young, Volunteer coordinator and his team of volunteers at the Vale of Rheidol Railway. The task was to clear the Llanbadarn straight. Running from Aberystwyth Station to the Level Crossing in Llanbadarn Fawr, the straight had become over grown with willow scrub and Japanese knotweed, obstructing the views and causing havoc with the abundance of catkins produced. It is thought that the Llanbardarn Straight section of the line was last cleared 15 to 20 years ago, so a large task was in hand. Historically, the Llanbadarn Straight has always been cleared to provide access to the buildings along that section of the line, such as the original pump house. The pump house is a very important feature to the heritage of the railway as it was once used to pump water from two bore holes in ground to what is now Aberystwyth mainline Station. The pump house provided one of main reasons to start the clearance, in hope that once the straight was cleared the views of this historical feature would be greatly improved. This would then make the structure more visible to the visitors that come to visit the Vale of Rheidol Railway, showing them a little bit of history along the way. There is now hope to re-establish the pump house back to working conditions within a few years. The clearing has also allowed access to the culverts along the straight. These culverts hold particular importance and are fundamental to the drainage of both the mainline and the Vale of Rheidol line by providing a channel for excess water to flow. By clearing it has allowed better access to the culverts which will then allow the Vale of Rheidol team to maintain them better, preventing flooding such as that seen during 2012. Now that the access has been greatly improved the next step will be further work with diggers to ensure proper drainage of the area. It is now November and the team have finally completed the project. Adam and the volunteers, Robert and Steve, have spent the past 11 months battling through large amounts of willow scrub and other shrubs to open up the line. Willow is a rigorous grower, flowering with catkins in early spring. Although, they do look rather attractive once in bloom, the catkin “fluff” produced did cause problems. The engines and carriages were constantly full of catkins throughout the spring and early summer which was not making it easy for any of the crew. A large amount of Japanese Knotweed was another plant tackled. Japanese knotweed is a highly invasive species which needs to be eradicated by law. Thanks to clearing the area, the team can now see how much work needs to be done to clear the Japanese knotweed and how long it should take. A 5 year plan has now been put in place to eradicate the Japanese knotweed completely, hoping for 30% clearance each year. Although a lot of trees have been removed in the process, there were plans to only remove those that were necessary to be remove. With this in mind, some trees have been left to add to the scenery. Many mature native trees, such as English oaks, have been left to add to the natural beauty of the area. Another way the team reduced the removal of trees was by only cutting back some of the growth or siding the taller trees. This has now created a wonderful attractive avenue of silver birch as the train line enters the Llanbadarn Straight. The train can now be seen as it passes through Llanbadarn, making a significant difference to views for passers-by, who can now see the steam engine as is steams its way past the rugby club and under the foot bridge. It has even opened up a better view of the main line next to it. I'm trying to work out how much Japanese Knotweed grows back each year if clearing 30% per annum takes 5 years.. Even if it didn't grow back at all, removing 30% per year would never clear it, and certainly not in five years. 100 x (0.70 to the power of 5) = 16.807% still remaining. Great news at the VoR, work has at last started on No7, out of service since 1998 - the frames have been moved into the new shed and the VoR have been awarded £288,000 from the Coastal Communities Fund to develop heritage skills in a project called "Our past is their future". Full details on their FB pages for those who have access but in short the grant will '... provide high quality heritage skills training within the working environment of one of Wales' premier scenic railways' which will include the restoration of No7, hopefully completed in about 2 years. andrewshimmin, michaelh, AndrewT and 1 other person like this. Fantastic news. Good luck to them! Looking at the photos of the new machinery in the shed, is that perchance the Kerr Stuart Sirdar "Diana" I see lurking in the background in one shot? Vale of Rheidol scoops Coastal Community Fund grant. The Vale of Rheidol Railway is delighted to anounce that it has been awarded £288,000 from the Coastal Communities Fund to develop heritage skills in a project called "Our past is their future"
The project will provide high quality heritage skills training within the working environment of one of Wales' premier scenic railways. • Initially the project will help to equip the railways new engineering workshop with additional machinery and specialist tools. • It will develop a sustainable training school and engineering business within the railway’s new workshops. • The project will employ two new engineers and an additional four apprentices. • They will start the restoration of iconic VoR steam locomotive No 7 “Owain Glyndŵr” which has been out of service for many years. The Vale of Rheidol recognises the importance of the next generation of staff, who will keep the railway running for many years to come. It aims to ensure that the existing skilled staff are able to pass on their specialist knowledge to ensure the Vale of Rheidol has a sustainable engineering future and make sure the specialist engineering practices of the past are not lost forever. During the project, the apprentices will be learning ‘on the job’ alongside skilled craftsman whilst attending college to achieve nationally recognised qualifications, and more importantly they will be learning skills in the work place which are not taught in college. By expanding the engineering team, it will allow the railway to tender for external engineering contracts making the Vale of Rheidol less reliant on seasonal funding streams and provide a service to other railways and museums throughout the UK. The all party parliamentary Group on Heritage Railways produced a report highlighting the success of the Heritage Railways in the UK and the importance of sustainable training. The report highlights the need to support railways like the Vale of Rheidol and the huge economic benefits they bring, not only in tourism revenue, but also offering training for skilled workers who then move to other well-paid jobs within the areas. Vale of Rheidol Locomotive No 7 is one of trio of distinctive locomotives that were designed to replace locomotives supplied by Davies & Metcalfe. Built in 1923 at Great Western Railway’s Swindon works alongside sister locomotive No 8. It gained the name “Owain Glyndŵr in 1956 named after the Welsh Prince. Over the years it has clocked up thousands of trips along the scenic route to Devil’s Bridge until being withdrawn from traffic at the end of the 1998 season. It has been stored pending overhaul since then. Work has already commenced with the frames being shot blasted and the wheels re-profiled. It will require heavy boiler work, new tanks, platework and a full overhaul of the chassis. As much as possible will be done in house by the railway engineering team. The overhaul work is likely to take two years. 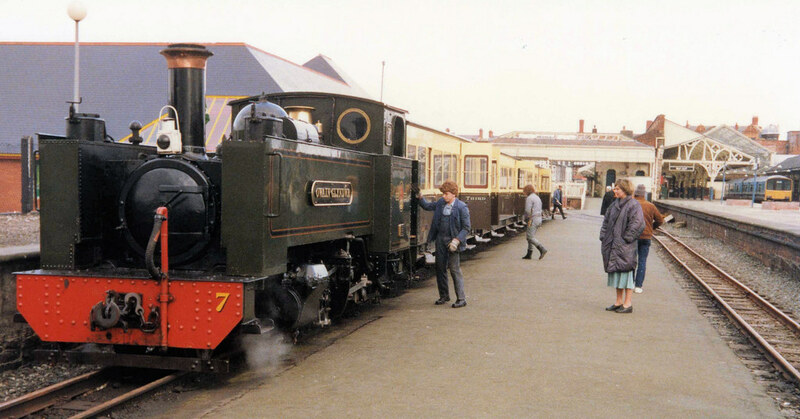 During British Rail’s ownership of the line, No 7 was well regarded by crews as being the ‘best of the fleet.’ In 1988, No 7 gained the distinction of hauling the very last steam hauled train operated by British Rail. 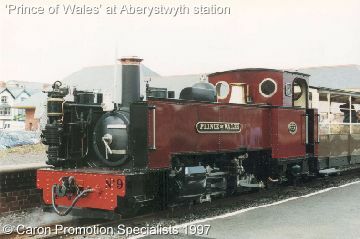 Locomotives No 8 “Llywelyn” and No 9 “Prince of Wales” have operated all services since 1998. Opened in 1902, the 11 ¾ mile Vale of Rheidol Railway has been operating a passenger service for tourists for over a hundred years. The line, which runs from Aberystwyth to Devil's Bridge is well known for its scenery, sharp curves and steep gradients and is a popular choice with holidaymakers in the region. The railway is a quality assured visitor attraction as designated by Visit Wales and attracts around 50,000 visitors annually from all over the world. The estimated economic impact of visitors to the Vale of Rheidol Railway was worth just under £1.3m to the local economy in 2011. Since this assessment has been carried out, visitor numbers have increased dramatically so it is estimated that the economic value to the area is now over £2 million annually. For many years the Vale of Rheidol Railway "Y Lein Fach" was part of the national rail network and rose to fame being the only steam on British Rail before the line was sold in 1989, becoming the first part of BR to be privatised. 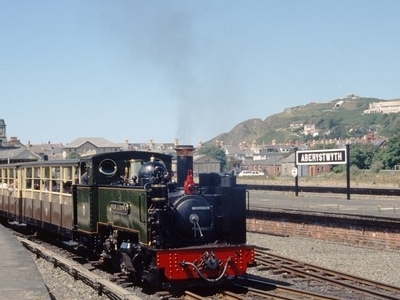 The railway has one of the largest collections of narrow gauge steam engines in the UK and has ambitious plans to display them in a purpose built museum in Aberystwyth. The workshop development is integral to the scheme. The railway has a proven record working with major grant funded schemes including. • A European funded development grant helped to to renew and upgrade the track. • Construction of our running shed and workshop with help from the Welsh Government Single Investment Fund and the Phyllis Rampton Narrow Gauge Railway Trust at a total cost of £1.3million. • A project to rebuild all the intermediate stations on the railway. This project was funded as part of Axis 3 of the Rural Development Plan for Wales (2007-2013) which is funded by the Welsh Government and European Agricultural Fund for Rural Development. The railway completed all works required and delivered all the required outputs.The current team have applied for and delivered the last two projects. Further details can be found on the Vale of Rheidol Railway's website:www.rheidolrailway.co.uk. Has a decision been made whether #7 will be restored in the GWR/BR condition with the low cab profile or with the Brecon Mountain Railway modifications to match her siblings? I'm half certain that No. 7 only ever had the bufferbeam cutouts and air brake mods done, and never had the cab and chimney raised like the others, nor the smokebox cladding removed, but I can't be certain. She certainly never had the massive lift received by No. 9 at the Brecon (which was later reduced a bit IIRC) http://www.westwales.co.uk/graphics/powales.jpg shows just how much she towered above the carriages following that initial rebuild. Also - interestingly - there's news in there about Diana, the little Kerr Stuart tank (ex Kerry Tramway).